She had always loved art, but, as a school-leaver in the dog-eat-dog recession of the 1980’s, Carmel Madigan chose to go the business route, and became an accountant. Back then this ambitious young business student could never have imagined that within a few decades she would be an internationally successful artist, author and founder of a Hedge School. After graduating with a Bachelor of Business Studies (Finance) degree from UL in 1983, Carmel spent the next 13 years working as a financial accountant in the banking and multinational sector. “It was very challenging and very fulfilling career,” she recalls, “but with a young family I found the work was not flexible enough. Carmel found the technology so fascinating, in fact, that in 1994, she left her job and established a company, Designer Print, in Ennis, employing a graduate from the Limerick College of Art and Design and offering a range of services from original design to small batch colour laser print. The company thrived, producing bespoke sales posters, auctioneering reports and even developed a range of wedding stationery, attracting agents throughout Ireland and abroad. “I wanted some quality time out to spend with James (my youngest) and his older siblings. “I also wished for more creative expression,” she recalls, adding that it was around then that she began to experiment with paint and brush and various media. 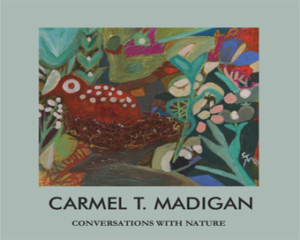 Once Carmel began to promote her work commercially, her reputation as an artist grew quickly and her pieces were exhibited in galleries in Dublin, Clare and Galway, as well as at the RDS Art fair and others: “This was the Celtic Tiger era. My work was very attractive and energetic and it began to sell very well,” recalls Carmel. “My background in accountancy was critical to my success in promoting my work,” she says now. “It took a full year to devise modules that would offer not only an art programme but also an ecology programme, for visiting professionals, tourists, and public at large,” she recalls. 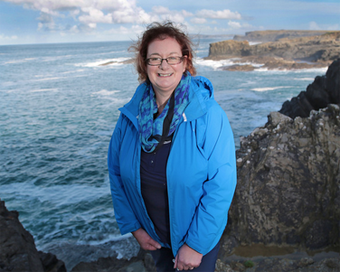 Over the past five years, and with the publication of her second book, the Hedge school has linked with other key players in the education market: “This year I devised and ran two fully booked and DES-approved CPD courses for teachers, while the hedge school has been successful in winning a contract to deliver the Explorers Education Programme for the Marine Institute. “We have had the Geography Department of Trinity College at the hedge school, in their quest to build knowledge around the ecology of Ross beach, with particular focus on bio-erosion and transportation. “Going forward, and with a background in the corporate sector, I’d like to offer ‘experience’ and ‘bonding’ sessions through engagement in both ecological and creative eco-systems,” she adds. “My work is my life and I enjoy everything I do,” she enthuses. “Everything I do feeds into the next thing I do!